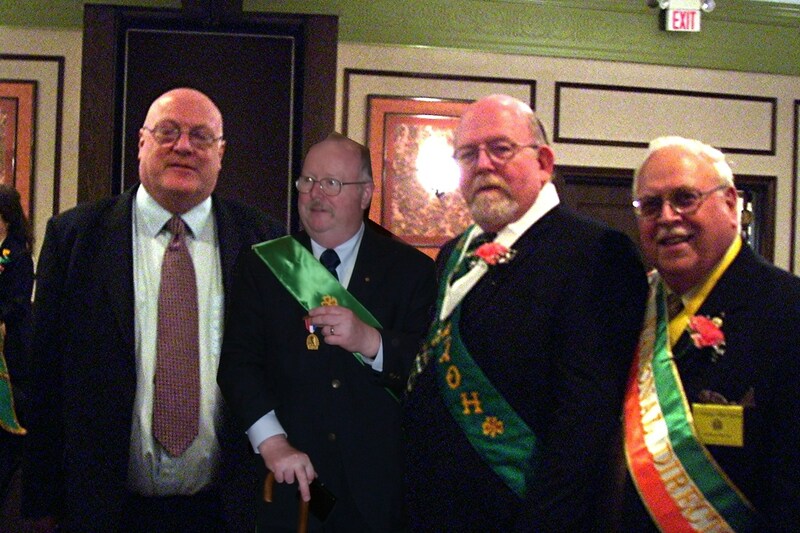 The Toledo Hibernian Divisions, the John P. Kelly AOH division and the Mother McAuley LAOH division, were formed in 1990. 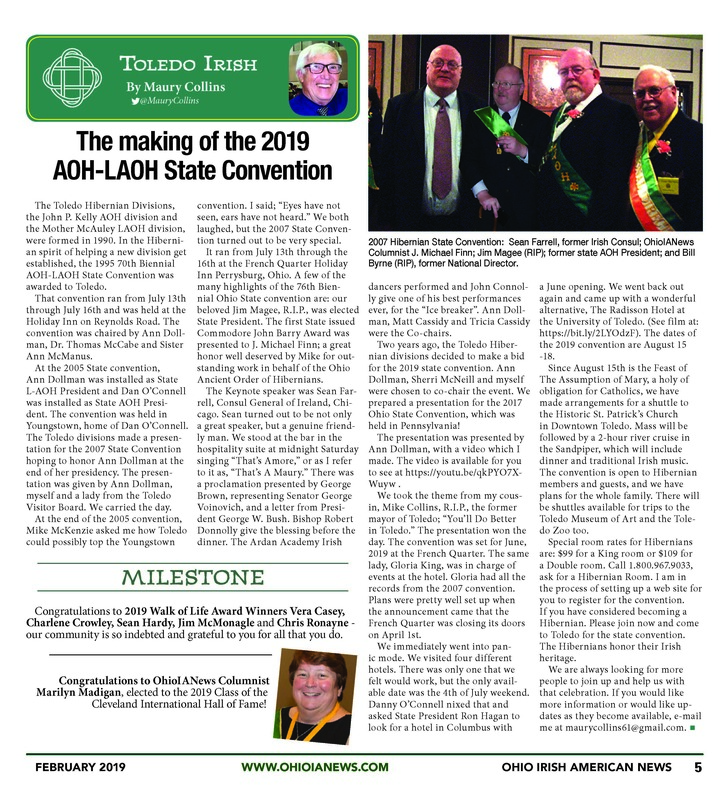 In the Hibernian spirit of helping a new division get established, the 1995 70thBiennial AOH~LAOH State Convention was awarded to Toledo. That convention ran from July 13ththrough July 16thand was held at the Holiday Inn on Reynolds Road. 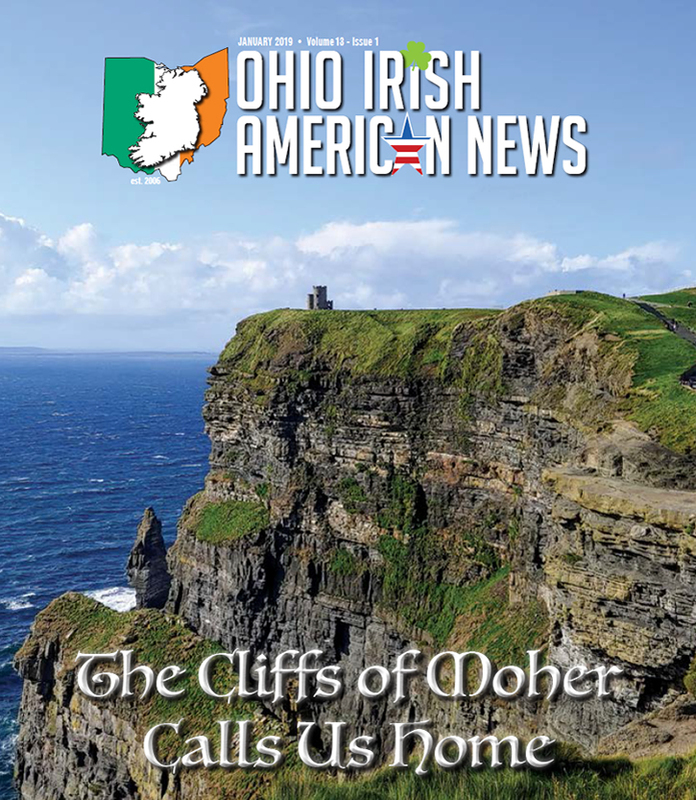 The convention was chaired by Ann Dollman, Dr. Thomas McCabe and Sister Ann McManus. At the 2005 State convention, Ann Dollman was installed as State LAOH President and Dan O’Connell was installed as State AOH President. The convention was held in Youngstown, home of Dan O’Connell. The Toledo divisions made a presentation for the 2007 State Convention hoping to honor Ann Dollman at the end of her presidency. The presentation was given by Ann Dollman, myself and a lady from the Toledo Visitor Board. We carried the day. At the end of the 2005 convention, Mike McKenzie asked me how Toledo could possibly top the Youngstown convention. I said; “Eyes have not seen, ears have not heard.” We both laughed, but the 2007 State Convention turned out to be very special. It ran from July 13ththrough the 16that the French Quarter Holiday Inn Perrysburg, Ohio. A few of the many highlights of the 76thBiennial Ohio State convention are: our beloved Jim Magee, R.I.P., was elected State President. The first State issued Commodore John Barry Award was presented to J. Michael Finn; a great honor well deserved by Mike for outstanding work in behalf of the Ohio Ancient Order of Hibernians. 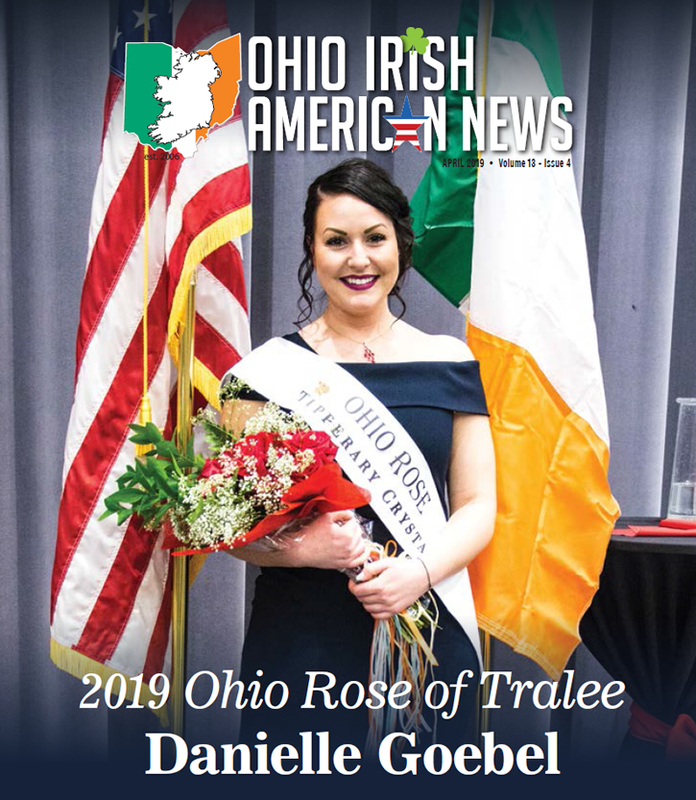 The Keynote speaker was Sean Farrell, Consul General of Ireland, Chicago. Sean turned out to be not only a great speaker, but a genuine friendly man. We stood at the bar in the hospitality suite at midnight Saturday singing “That’s Amore,” or as I refer to it as, “That’s A Maury.” There was a proclamation presented by George Brown, representing Senator George Voinovich, and a letter from President George W. Bush. Bishop Robert Donnolly give the blessing before the dinner. 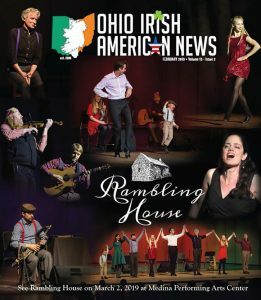 The Ardan Academy Irish dancers performed and John Connolly give one of his best performances ever, for the “Ice breaker”. Ann Dollman, Matt Cassidy and Tricia Cassidy were the Co-chairs. Two years ago, the Toledo Hibernian divisions decided to make a bid for the 2019 state convention. Ann Dollman, Sherri McNeill and myself were chosen to co-chair the event. We prepared a presentation for the 2017 Ohio State Convention, which was held in Pennsylvania! We took the theme from my cousin, Mike Collins, R.I.P., the former mayor of Toledo; “You’ll Do Better in Toledo.” The presentation won the day. The convention was set for June, 2019 at the French Quarter. The same lady, Gloria King, was in charge of events at the hotel. Gloria had all the records from the 2007 convention. Plans were pretty well set up when the announcement came that the French Quarter was closing its doors on April 1st. We immediately went into panic mode. We visited four different hotels. There was only one that we felt would work, but the only available date was the 4thof July weekend. Danny O’Connell nixed that and asked State President Ron Hagan to look for a hotel in Columbus with a June opening. We went back out again and came up with a wonderful alternative, The Radisson Hotel at the University of Toledo. (See film at: https://bit.ly/2LYOdzF). The dates of the 2019 convention are August 15 ~18. 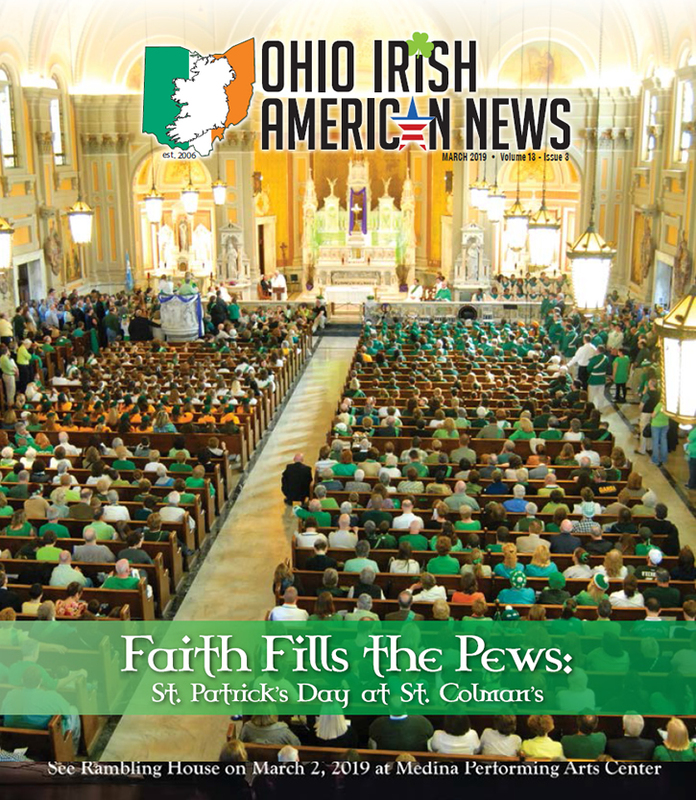 Since August 15this the Feast of The Assumption of Mary, a holy of obligation for Catholics, we have made arrangements for a shuttle to the Historic St. Patrick’s Church in Downtown Toledo. Mass will be followed by a 2-hour river cruise in the Sandpiper, which will include dinner and traditional Irish music. The convention is open to Hibernian members and guests, and we have plans for the whole family. There will be shuttles available for trips to the Toledo Museum of Art and the Toledo Zoo too. Special room rates for Hibernians are: $99 for a King room or $109 for a Double room. Call 1.800.967.9033, ask for a Hibernian Room. I am in the process of setting up a web site for you to register for the convention. If you have considered becoming a Hibernian. Please join now and come to Toledo for the state convention. 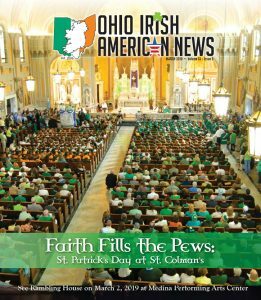 The Hibernians honor their Irish heritage. We are always looking for more people to join up and help us with that celebration. If you would like more information or would like updates as they become available, e-mail me at maurycollins61@gmail.com.